I wouldn't be surprised if these are MV. They could be as old as 1969 - when the building was done. 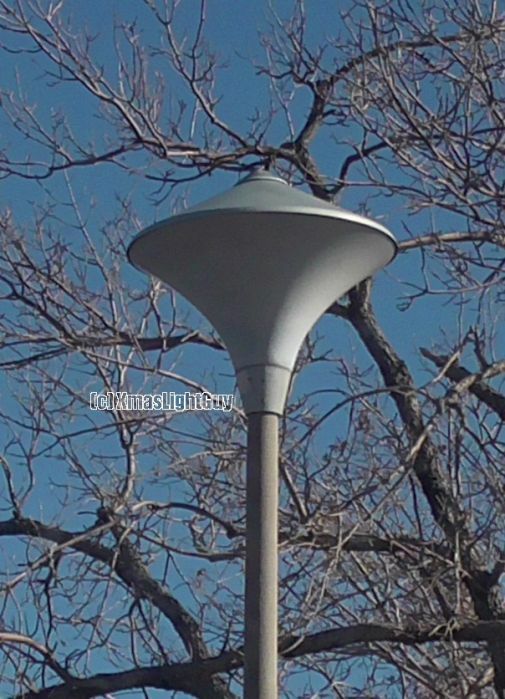 Thats a GE PowrGlo fixture. Any guess on its age? Umm, around possibly 1960s or 1950s I believe? I think @NiMo might know. @lightingfan8902: Then I'll just assume they are original to the building .. so 1969. That's either a P250 or P400 Powerglow light. They can be as large as to accomodate 4X1000 watt MV lights. THAT is a heavy fixture and probably requires a small crane or hoist to lift it to the top of the pole. I'll figure they are the P250.. its a fairly small parking lot, and the poles aren't all that tall. These are also HPS, but I'm assuming they were converted at some point. Yeah, they can be pretty heavy! @xmaslightguy. I remember seeing one of those P4000 Powerglows in my neighborhood at McClellan Circle way back in the early 70s. It was replaced with four M1000s until 1986 when they were replaced with 4 Crouse-Hinds OVMs at 400 watt HPS each. Hmm, are the OVMs still there, @NiMo, or got replaced? McClelland, McKinley, and South Shore circles were redone in the early 2000s. All those center poles were replaced with 5X175 acorn post top lights on 16 foot poles. Don't think I've ever seen a 5x acorn post top before!